It’s helpful to know the performance characteristics when selecting a disk type for an Infrastructure as a Service (IaaS). In this blog post we describe the results of benchmarking various disk types of various IaaSes, including Amazon Web Services (AWS), Microsoft Azure, Google Compute Engine (GCE), and VMware vSphere. We measure Input/output operations per second (IOPS), read throughput, and write throughput. It’s helpful to know the performance characteristics of disks when selecting a disk type. For example, the performance of a database server will be greatly affected by the IOPS of the underlying storage. Similarly, a video-streaming server will be affected by the underlying read throughput. If you need a fast disk, nothing beats a local vSphere NVMe drive. Nothing. Whether its IOPS, read throughput, or write throughput, NVMe is the winner hands down. Google’s SSD (Solid State Drive) storage has 22× the IOPS of its standard storage. For general purpose use, always go with the SSD; however, if you’re doing streaming (long reads or writes), the standard storage may be the better (and cheaper) choice. AWS’s io1 disk is a waste of money unless you need an IOPS > 4k (the gp2 disk has an IOPS of ~4k). AWS’s now-deprecated standard storage has a decent IOPS of ~2k. The key to getting IOPS out of Azure is to enable Host Disk Caching, which can catapult an anemic 120 IOPS to a competitive 8k IOPS. These benchmarks are not gospel. Even though they are recorded precisely, they are not precise. For example, we report the GCE pd-standard Read MB/s as 43, which was the average over the course of ten runs, but the metric is more nuanced — the first four runs averaged 98 MB/s, and then, once Google throttled the performance, dropped precipitously to 6 MB/s. Your mileage may vary. We feel that, in general, IOPS is the most important metric when judging storage speed: The advent of solid-state drives (SSDs) with their high IOPS (>10k) exceeding by traditional hard disk drives by an order of magnitude or more, was a game-changer. Below is a chart of the results of the IOPS benchmark. Note that the 256 GiB Google SSD drive appears to be the winner, but only because we have excluded the results of the vSphere local SSD disks (SATA & NVMe) from these charts (don’t worry, we’ll include them in a chart further down). Also note that Google scales the performance of the disk with the size of the disk: all else being equal, the bigger disk will have better performance, and we see that reflected in the scoring: the 256 GiB Google SSD disk leads the pack, but the 20 GiB disk lands squarely in the middle. While we’re on the topic of Google, its standard drive takes two of three worst slots of IOPS performance. The 256 GiB standard drive has an IOPS of 239, the 20 GiB, 162. Note that these numbers aren’t bad for magnetic disk storage (a typical magnetic hard drive will have 75-150 IOPS), it’s just that they seem lackluster when compared to the other IaaSes’ storage offerings. AWS’s io1 storage is a “tunable” storage offering — you specify the number of IOPS you require. In our benchmarks we specified 1,000 IOPS, and we were pleased that AWS exceeded that by 20%. Interestingly, the io1 numbers were precisely clustered: across all ten runs the IOPS were within ±2 of each other (standard deviation of 1.8). Read performance is important for applications which stream large amounts of data (e.g. video servers). It’s also useful for applications which fling disk images around (e.g. BOSH Directors). Once again we see Google’s 256 GiB SSD leading the pack, and vSphere’s iSCSI FreeNAS server not far behind (never underestimate the throughput of seven magnetic drives reading in parallel). Interestingly the read performance of AWS is fairly consistent across all three of its offerings (standard, gp2, io1), which leads to the conclusion that if you’re on AWS, and you use the storage for streaming reads, then AWS standard is the cost-effective answer (be careful: we did not benchmark AWS’s “Throughput Optimized HDD” storage type, st1, which may be a better solution). Although Google’s SSD storage turns in great performance numbers, their standard storage doesn’t, landing second-to-last in terms of read throughput. Write performance is important for applications which write large files: e.g. disk images, BOSH stemcells, large videos, etc. Once again, the Google SSD 256 GiB is the leader, and by a decent margin, too. Second place is the Azure Premium 256 GiB, which is a surprise because until this point Azure has had a difficult time cracking the top half of these charts. The next three are the AWS storage types, which have been clustered together for the two previous benchmarks as well, leading one to conclude that AWS storage types are more similar than they are different. Google, besides taking the lead, also corners three of the bottom four slots: Google storage can be fast, but can also be slow. Also, the Google standard offering again is surpringly faster than the 20 GiB SSD, so, for small disks on Google where throughput is important, choose standard storage over SSD. AWS storage options are noted more for their similarity than for their differences. A note about the chart below: The storage type (e.g. “io1 20 GiB”) is denoted on the horizontal axis at the bottom. IOPS, represented in blue, are recorded on the axis on the left (e.g. “io1 20 GiB” has an IOPS of 1210). Throughput, both read and write, are recorded on the axis on the right (e.g. “io1 20 GiB” has a read throughput of 94 MB/s). Amazon differs from Azure and Google in that it doesn’t scale performance to the size of the drive. Looking at the chart above, it would be difficult to distinguish the 20 GiB standard drive from the 256 GiB standard drive from the performance numbers alone. Indeed, one might be surprised to discover that the bigger drive has slightly worse performance than the smaller one (which we discount as being statistically insignificant). IOPS seems to be the real differentiator, not throughput (the throughput numbers are very similar across storage types, though gp2’s throughput is marginally faster than standard’s). And io1 is certainly expensive; of our AWS charges for the month during which these benchmarks were run, the io1 storage accounted for over half the cost (which included the cost of the EC2 instances, network bandwidth, etc.). And when one considers that the io1 was configured with a very modest 1k IOPS, it becomes apparent how expensive io1 is (we suspect that io1 storage with 10k IOPS may radically eclipse other AWS costs for many customers). The difference between Amazon’s “Previous Generation” standard storage and its gp2 storage is mostly IOPS, for half the price ($0.05/GB-month vs. $0.10/GB-month at the time of this writing) standard offers half the IOPS (1913 vs. 3634), with almost identical throughput numbers. Save your money if you need the storage but not the IOPS. AWS’s write throughput consistently outperforms its read throughput, which may indicate their storage backend uses write-caching. Never one to be intimidated by complexity, AWS has a baroque credit system for its gp2’s performance which tilts the field in favor of VMs that are spun up briefly to run benchmarks such as GoBonnieGo — a long-running VM with heavy disk usage may not see the performance reflected in our results. We ran a special benchmark to determine if we could exhaust our credits, and the answer was yes, we could, but it took three hours. See below for details. If you want IOPS on your Azure VMs, we strongly encourage you to set your Premium Storage disk caching to ReadOnly at a minimum, ReadWrite if your application can stomach the loss of writes (but don't do this for databases). How to read the chart: The horizontal axis denotes the storage type. The first two letters of the storage type are either “st” or “pr”, denoting Azure Standard storage and Azure Premium storage, respectively. The second part is a number, either 20 or 256 representing the size of the disk in GiB. Finally, the optional suffix “rw” means that ReadWrite caching was enabled on that disk. To tie it all together with an example, “pr 256 rw” means that the benchmark was performed on a 256 GiB drive of Azure Premium storage with caching set to ReadWrite. IOPS, represented in blue, are recorded on the axis on the left (e.g. “st 20 rw” has an IOPS of 8219). Throughput, both read and write, are recorded on the axis on the right (e.g. “pr 256” has a read throughput of 90 MB/s). 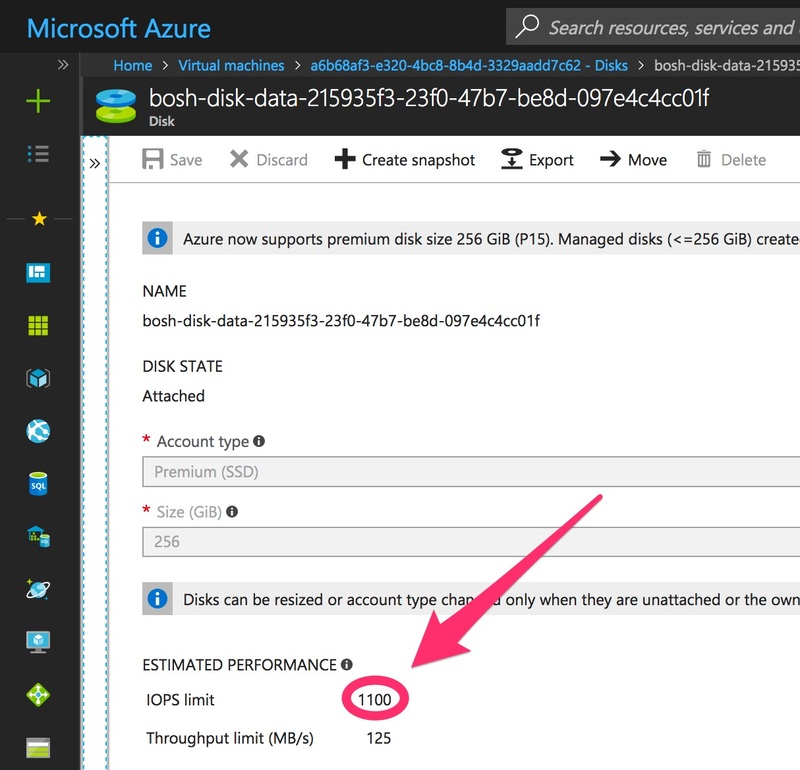 On Azure, the bigger disk will outperform the smaller disk; however this changes once you enable caching: disks of different size will perform identically when caching is enabled. As you can see in the chart above, the performance of the Standard 20 GiB disk (“st 20 rw”) is almost identical to the Premium 256 GiB disk (“pr 256 rw”) — if you placed your hand over the legend, you’d be hard-pressed to distinguish the two disks based on their performance. Azure’s pricing for Standard storage is approximately $0.048 per GiB/month for 32 GiB, which is a hair under AWS’s pricing for its deprecated standard disk ($0.05 per GiB month) but slightly over AWS’s st1 Throughput Optimized offering ($0.045 per GiB/month). Azure’s Premium storage comes in at $0.165 for 32 GiB, which is a hair under Google’s pricing for its SSD offering ($0.17 per GiB month). Google takes the crown for both the best and the worst. There’s a 22× increase in their performance between their Standard offering and their SSD offering (for comparison, AWS’s is 2× and Azure’s is 1×), and Google also scales performance by disk size, which means that the 256 GiB SSD leads the pack, and the 20 GiB Standard — well, let’s just say it tries its best. The thing to understand is that the performance numbers for Google’s standard drive are worse than they appear — the storage is able to put up a good front for the first twenty minutes (each benchmark takes approximately 4-5 minutes to run on the Google Standard), and then the performance collapses. Google isn’t unique among the IaaSes for this performance cliff — AWS experiences the same drop-off for its gp2 20 GiB drive. We can see in the illustration below that the drop-off is similar to Google’s; however, the drop-off occurs much later in AWS — rather than occurring on the fifth run as had happened in Google’s case, Amazon’s performance collapsed on the thirty-fourth run. Google collapsed after 20 minutes; Amazon collapsed after 3 hours. Our vSphere benchmarks were carried out under near-optimal [Optimal] conditions; there were no noisy neighbors. Before we discuss the performance of vSphere local disks, we’d like to point out that the vSphere non-local storage (the FreeNAS-based iSCSI storage) carried itself quite admirably in the benchmarks, placing 2nd in IOPS, 2nd in read throughput (and the middle of the pack in write throughput — nothing is perfect). This is doubly impressive when one takes into account that the vSphere storage setup that we benchmarked is not a professional setup — the networking backend is 1 Gbps, not 10 Gbps, the disks are magnetic, not SSDs (though with an SSD cache). It would not be unreasonable to assume that a professional grade storage backend, e.g. a Dell EMC VNX5600 would turn in better results, possibly toppling the reigning champion, Google. We can see that in every measure, the performance of local disks dwarf the performance of Google’s flagship offering. But local disks are not a perfect solution, for they offer speed at the expense of reliability (a true Faustian bargain) — one disk crash and the data’s all gone. Also, local SSD disks are available on AWS, Azure, and Google, and, although we have not benchmarked their performance, it’s something we’d be very interested in (we haven’t benchmarked those because the ability to use local disks would require a significant change to BOSH, the cloud orchestrator we use to deploy the VMs on which we run our benchmarks). We used BOSH to deploy VMs to each of the various IaaSes. For those interested in replicating our tests or reproducing our results, our BOSH manifests and Cloud Configs can be found here. We spun up a VM, and ran the benchmark ten times in succession, storing the results in JSON format (i.e. we passed the arguments -runs 10 -json to GoBonnieGo). The numbers displayed in the charts and tables are the averages of the ten runs. Each VM was configured with a BOSH persistent disk of a certain type (e.g. Google SSD 256 GiB). We instructed GoBonnieGo to exercise the persistent disk (not the root nor the ephemeral disks) (i.e. we passed the argument -dir /var/vcap/store/gobonniego to GoBonnieGo). A write test, which creates a set of files consisting of random data whose aggregate size equals twice the physical RAM of the VM (e.g. for the AWS test, which used a c4.xlarge instance type with 7.5 GiB, GoBonnieGo created a set of files whose footprint was 15 GiB). The throughput (write MB/s) is calculated by taking the total amount written (e.g. 15 GiB) and dividing by the time it takes to write that amount. The test writes 64 kiB blocks of random data. At that point, GoBonnieGo clears the buffer cache to avoid skewing the upcoming read benchmark. A read test, which reads the files created by the write test. Again, the throughput (read MB/s) is calculated by taking the total amount read (e.g. 15 GiB) and dividing by the time it takes to read that amount. The read blocksize is 64 kiB. GoBonnieGo clears the buffer cache again, to avoid skewing the upcoming IOPS benchmark. Finally, GoBonnieGo runs an IOPS test, where it randomly seeks to locations in the test files, and then either reads or writes a 512-byte block (with a 9:1 ratio of reads to writes). It runs the test for approximately 5 seconds, and at the end tallies up the total number of reads & writes and divides by the duration. GoBonnieGo then deletes its test files and records its results. Our overarching goal was to have 8 cores for the vSphere NVMe SSD benchmark. The reason we wanted so many cores was that the processor, an Intel Xeon Processor D-1537, which is clocked at a measly 1.7 GHz, became the choke point. That’s right: The Samsung NVMe was so fast that it shifted the choke point from storage to CPU — we were no longer benchmarking the SSD; we were benchmarking the CPU! This problem was caused by three factors: slow clock speed, fast disk, and a single-threaded filesystem benchmark program (bonnie++). This test [bonnie++] is limited by: CPU speed … and by the fact that it is single-threaded. Our first clue that something was amiss was that the our initial benchmark gave baffling results — the Crucial SATA, which should have been slower than the Samsung NVMe, was instead faster. We were at a crossroads: our benchmarking tool, bonnie++, wasn’t able to properly benchmark our NVMe storage, but we didn’t want to omit those results from our blog post, so we decided to do what any self-respecting developer would do: write our own filesystem benchmark tool! We wrote GoBonnieGo, A Golang-based filesystem benchmark tool which uses concurrency to run on as many CPU cores as available. Through experimentation, we found that four cores wasn’t enough to benchmark the Samsung NVMe (all four CPUs were at 100% utilization), but that six cores was. Six, however, is not a power of two, so we rounded up to 8 cores. We wanted 4-to-8 GiB RAM, dependent on what the IaaS allowed us. The amount of data written for each benchmark was twice the size of physical RAM, so VMs with twice the RAM should have no added advantage (buffer cache notwithstanding). We chose to run our test on the BOSH persistent disk, for it was more flexible to size than the root disk. We chose a disk size of 20 GiB, with the exception of Azure, where we ran a second benchmark with a disk of 256 GiB. We wrote our own benchmark program; it may be grossly flawed. Each benchmark (e.g. AWS gp2) was taken on one VM. That VM may have been on sub-optimal hardware or suffered from the “noisy neighbor” effect. The time that a benchmark was taken may make a difference. A benchmark taken at 3:30am on a Sunday may have better results than a benchmark taken at 10:30am on a Monday. A more comprehensive benchmark would consist of many tests taken at different times. Our benchmarks were done on Sunday night, but it may have adversely affected the Azure test, which was in Singapore, and was Monday morning there. We only selected one instance type for each IaaS (e.g. AWS’s c4.xlarge). Running our benchmark across many instance types may show interesting results. We didn’t cover all the volume types; for example, we did not benchmark AWS’s st1 (Throughput Optimized HDD) or sc1 (Cold HDD) volume types. We only tested AWS’s gp2 and io1. [Optimal] The vSphere benchmark runs suffered almost no disk contention from 40+ VMs running on the same hardware, making the vSphere results optimal. Below are screenshots of the disk usage on the two physical machines (ESXi hosts) on which ran the VMs which ran the benchmarks (the benchmarks were not running when these screenshots were taken). Note that the peak disk usage was 3.6 kBps. To put that into perspective, the slower (SATA, not NVMe) vSphere disk throughput for write was 462 MBps: based on these charts, the disk usage from the other, non-benchmark VMs degraded the results of the benchmark by, at most, 0.008%. In other words, rather than suffering from “noisy neighbors”, the vSphere neighbors were quiet. Dead-quiet. The benchmark VMs had the underlying storage hardware almost completely to themselves. [FreeNAS] Our iSCSI-based FreeNAS setup has been described in two blog posts (here and here), so we will not go into details other than to mention the network interface is 1 Gbps link, not a 10 Gbps link, which caps the throughput to ~100 MB/s. In other words, with a higher-speed Network Interface Controller (NIC) we could expect faster throughput. Indeed, we ran our benchmark locally on the FreeNAS server, and our throughput was ~200 MB/s, which is fast, but will never approach the throughput of the NVMe (~1500 MB/s) or even the SATA (450 MB/s); however, what the FreeNAS offers that the NVMe and the SATA don’t is redundancy: a disk failure on the FreeNAS is not a calamitous event. [Samsung] The Samsung SSD 960 2TB M.2 2280 PRO is installed in a Supermicro X10SDV-8C-TLN4F+ motherboard with a soldered-on 1.7 GHz 8-core Intel Xeon Processor D-1537, and 128 GiB RAM. The results of the CPU-constrained bonnie++ v1.97 benchmarks of the Samsung 960 PRO are viewable here. [Crucial] The Crucial MX300 1TB M.2 Type 2280 SSD is installed in an Intel Skull Canyon which features a 2.6 GHz 4-core Intel Core i7-6770HQ and 32 GiB RAM. The results of the bonnie++ v1.97 benchmarks of the Crucial MX 300 are viewable here. The photograph below shows the Crucial SSD, but astute observers will note that it’s not the Skull Canyon motherboard (it isn’t) — it’s the Supermicro motherboard. The worst-case scenario for the cost of a 256 GiB Standard disk on Azure was ~22× too high: it is $64.80, not $1,425.60. Thanks Mike Taber! Clarified Dell’s relationship to Pivotal Software: Dell is an investor in Pivotal; Dell is not the owner of Pivotal. Used the more-accurate numbers generated by a second run using the newer GoBonnieGo 1.0.7 which clears the buffer cache before the IOPS and read tests. The IOPS number is both lower and more accurate. Updated tables and charts. Removed the vSphere local disk benchmarks from the charts; the numbers were too good and dwarfed the results of the other IaaSes and made them hard to read. Created a highlights section which has important take-aways for each IaaS. Removed the Take-aways section; it was no longer needed. Expanded the metrics (IOPS, read, and write) commentary. Added a section specific to each IaaS. On Azure, called out the importance of enabling host disk caching. If not enabled, Azure’s IOPS are abysmal. Added new test results for Azure disks with host disk caching enabled. Included a more in-depth description of the benchmarks (10 runs, IOPS, read, write, clearing of the buffer cache). Added a measurement of AWS’s and Google’s performance-throttling. Shrunk the presented size of several images — they took up almost the entire page! Fixed the Azure VM type (included the “s”). Switched the order of the columns of the chart at the top (IOPS, write, read → IOPS, read, write) to match the remainder of the post. Removed the Azure footnote — nothing was referring to it, and it had no information that wasn’t already mentioned elsewhere in the post. Modified the URL of the images to point to their location on GitHub, not Google Photos. Google Photos has the unfortunate habit of expiring URLs after a few days, and we are disappointed with them. Added anecdotal evidence of the expense of AWS’s io1 storage type (it’s quite expensive).